The article below was published on August 7, 2017 by Bloomberg BNA, written by Sara Hansard. Small and midsized companies are increasingly providing their own health coverage for employees instead of buying fully insured plans since Obamacare was enacted in 2010. As the Affordable Care Act drives up premiums because of more requirements and taxes, self-insurance has become a more attractive option because it is often less expensive than purchasing fully insured plans, people with knowledge of health insurance markets say. But some policy analysts argue the companies that are self-insuring generally have healthy employees and that leaving the fully insured risk pool results in higher costs for fully insured companies with older, less healthy employees. 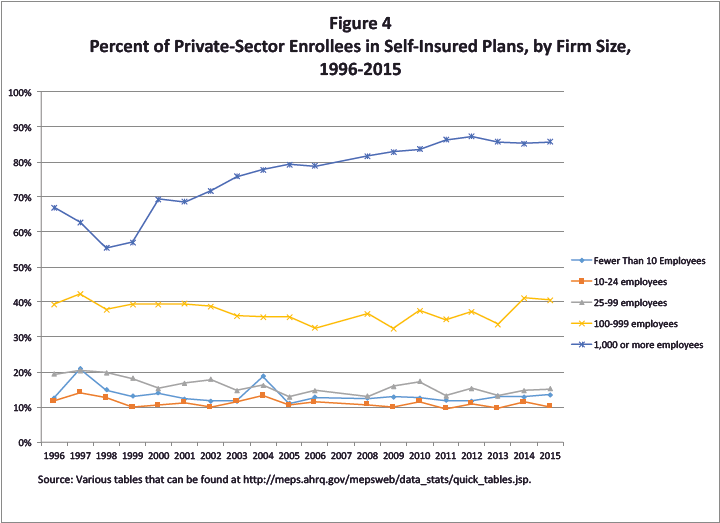 Between 2013 and 2015, as a result of an increase in self-insured plans among small and midsized employers, the percentage of covered workers enrolled in self-insured plans increased from 58.2 percent to 60 percent, according to data from about 40,000 employers interviewed by the U.S. Department of Health and Human Services and compiled by the Employee Benefit Research Institute (EBRI). Under self-insurance, expenses are paid directly by companies as they are incurred. Under fully insured policies, employers pay premiums to insurance companies that take the risk of covering employees. Sponsors of self-insured plans often purchase stop-loss policies that reimburse for catastrophic claims and/or aggregate claim totals that exceed pre-determined limits. Most large companies use self-insurance administered by insurers or third-party administrators. The largest increases in self-insured coverage occurred in establishments with 100-999 employees, rising 21 percent from 33.6 percent of employees in 2013 to 40.5 percent in 2015, and among establishments with 25-99 employees, where the practice increased from 13.2 percent to 15.2 percent, a 15 percent increase. Self-insured plans generally have to follow the same regulations that govern fully insured plans under the ACA, Fronstin said. But “the ACA piled on. A lot of things added up,” such as covering part-time employees who work 30 hours a week and having to cover dependent children up to the age of 26, he said. Employers have found they can counteract some of the increased cost by self-insuring, “especially if you have a decent risk pool” of healthier employees, Fronstin said. Mercer Health & Benefits LLC, which provides health-care consulting and brokerage services, has also found increases in the use of self-funding among the employers it surveys annually, principal James Bernstein told Bloomberg BNA. Bernstein is based in Mercer’s Cincinnati office. The largest movement Mercer found was among midsized companies with 500 to 1,000 employees. Fifty-one percent of those companies self-insured in 2014, while 66 percent did so in 2016, Bernstein said. There are geographical differences as well, he said. Employers in the Midwest led the pack with about 74 percent self-insuring, while fewer employers in the Northeast and West Coast self-insured because health maintenance organizations such as Kaiser Permanente are more prevalent there, he said. Self-insurance is gaining more traction among midsized companies because they can take advantages of discount programs with pharmacy benefit managers, national stop-loss carriers, and health management programs, Bernstein said. Those programs aren’t generally available to smaller companies, he said. Over the past five years that Hardwood Products Co. has been self-insured, health-care spending has decreased by about $900,000 even as the number of employees increased by 50 to about 470, Chief Financial Officer Scott Wellman told Bloomberg BNA. The company, based in Guilford, Maine, manufactures tongue depressors and other medical and nonmedical woodenware. One of the main reasons employers self-insure is it gives them more power to lower medical expenses. Hardwood Products has about 30 diabetics, and the company partners with Tufts Health Plan in Boston on disease management practices, Wellman said. Costs for treating those patients average under $1,800 annually, far below national average costs between $4,500-$5,000 for claims, he said. “And they’re getting better care,” he said. Hardwood Products has a stop-loss policy with Pareto Captive Services LLC to cover annual claims above $80,000. The average employee size of the 400 companies served by Pareto is about 120 employees, Andrew Cavenagh, founder and managing director of the Philadelphia-based company, told Bloomberg BNA. Over the past year premium increases for long-term members “were effectively zero,” Cavenagh said. Typical stop-loss policies only cover excess claims for one year. Pareto’s stop-loss policies provide more protection from multiyear claims that exceed the threshold by pooling assets from its members, he said. Service Uniform, a Denver-based company that rents work uniforms, decided to self-insure in 2014 as a result of the ACA, corporate general manager Dennis Tschida told Bloomberg BNA. “It scared us to death because there’s a lot of unknowns,” such as ensuring that plans met the law’s requirements for affordability and taking action to prevent being subject to the Cadillac tax on high-cost plans, he said. The Cadillac tax has been delayed until 2020. The company was able to modify its plan to provide employees better access to physical therapy treatments; improve the design of its pharmaceutical plan; and add telemedicine and concierge medicine services, Tschida said. The company, which had experienced 15 percent to 18 percent premium increases in prior years, was able to save about $200,000 in the first two years, he said. AEgis Technologies Group Inc., a Huntsville, Ala.-based defense contractor, has had modest health-care cost increases from $8,355 in 2013 to $9,657 in 2016 after it began self-insuring, an increase of about 16 percent, Chief Financial Officer Rodney Kreps told Bloomberg BNA. During this period, he said, fully insured rates have climbed at annual rates of 15 percent to 20 percent. The company has about 325 employees. AEgis also uses high-deductible plans coupled with health savings accounts, which the company helps fund. That gives employees incentives to be cost-conscious, and some employees have been able to build up HSA accounts to $1 million, which can be carried over from year to year, Kreps said. But some health-care policy analysts argue there is a downside to the trend of self-insurance. More insurers are offering self-funding and stop-loss plans to attract healthy employer groups, according to a study recently published by the Robert Wood Johnson Foundation (RWJF). Self-insurance plans are “marketed almost exclusively to healthy groups, groups that have very, very good claims experience,” Sabrina Corlette, a research professor with Georgetown University’s Center on Health Insurance Reforms and an author of the study, told Bloomberg BNA. “Once they self-fund they are no longer part of the risk pool for the ACA fully insured market,” Corlette said. “If you have a critical mass of healthy employers leaving the market, that can lead to premium hikes in the traditional, fully insured market,” she said. “You can have ever-increasing premiums for the employers that can’t qualify for the self-funded plans because they can’t pass underwriting.” In the past some states have acted to limit the use of stop-loss policy sales to small groups, Corlette said. But more recently, states such as New Mexico, Vermont and Minnesota have made it easier to sell stop-loss policies to small groups, she said. “Insurers and brokers are encouraging them to do that,” she said of the states moving in that direction.